Having travelled from Somerset to London I arrived at The Arch still slightly wishing I were still in the September sunshine of the West Country; however, it didn’t take long for The Arch to convince me that it was good to be back in London! 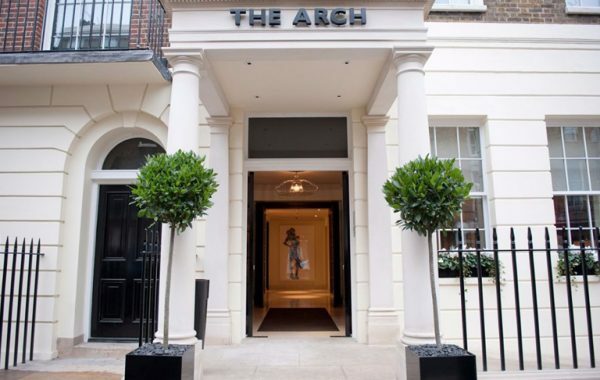 Located on a quiet residential street, the hotel is a short walk from Marble Arch and the exclusive areas of Bond Street, Mayfair and Hyde Park. The hotel comprises seven Grade II listed Georgian townhouses and two mews houses, now cleverly and sensitively combined. The entrance is discreet and the reception a glamorous mix of leather, glass and marble; along with statement artwork from rising British talent. Tall Dark and Handsome and I were whisked downstairs to the lower ground floor level and into the glorious luxury of the Abbey suite. 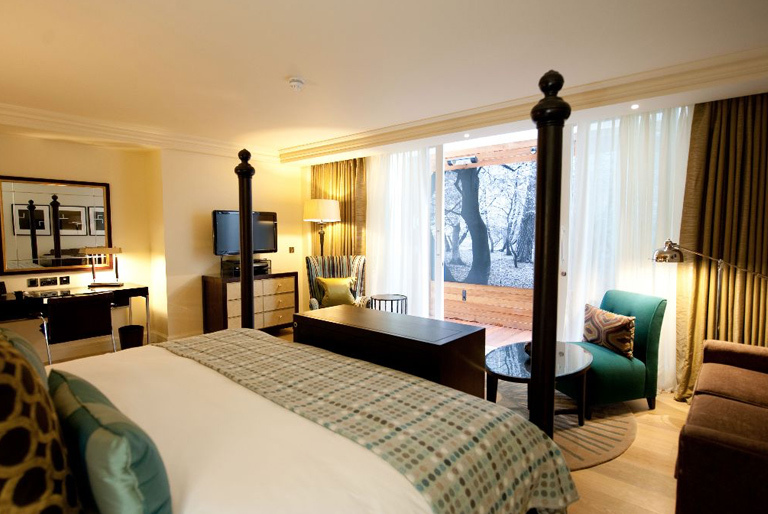 The room is extravagant, with a four-poster bed, private courtyard, and kitchen area. The décor is stylish, with the pale wood flooring and plush comfy chairs and sofa resulting in a homely luxuriance. The oriental framed prints are unusual and feature wallpaper sports a hand-painted koi carp design in muted gold and duck egg blue. 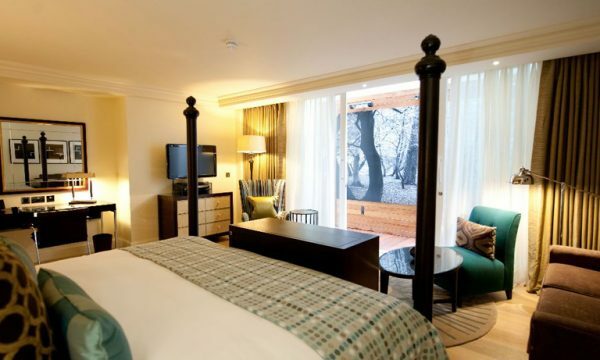 The room bursts with technology: a large flat-screen television and then a second at the foot of the bed…oh and one in the bathroom; an iPod docking station, a full Sky HD TV package, internet radio and wifi. The room also has a fully stocked mini bar, Jing teas, a Nespresso coffee machine, and MALIN + GOETZ toiletries. With two wardrobes and a chest of drawers there is plenty of storage space if your stay is an extended one. We had a fairly quick turnaround before dinner, but there was time to enjoy the cavernous bathroom with its heavenly rain shower, twin sinks, bidet and heated mirrors to avoid the dreaded steam-up. The private courtyard was bijou with a photographic forest backdrop, providing a surprisingly calming atmosphere, with outdoor seating and lighting and a chance to get some air. 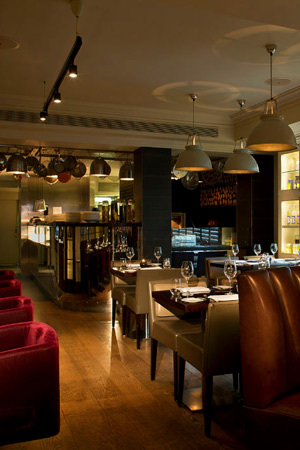 We dined at the hotel’s ground floor restaurant, named Hunter 486 after the 1950s dialing code for Marylebone. 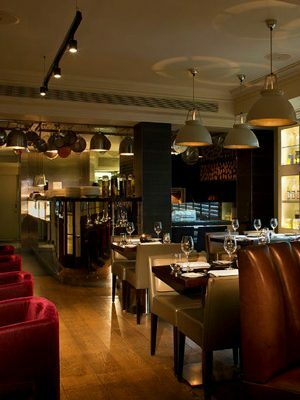 The restaurant features VIP club style leather booths, modern glass chandeliers and more statement art. We were ushered into a private booth with a soft semi-translucent veil curtain to screen us from other diners (who knows what nefarious deeds they thought or indeed feared we might perpetrate!). I opted for baked prawns – sumptuous in a Spanish style tomato, garlic and onion sauce – followed by a rib eye steak, accompanied by a rich mash and spinach and peas and carrots. TDH had a particularly fine lemony cured duck salad with pickled baby vegetables, rocket and purple cress. 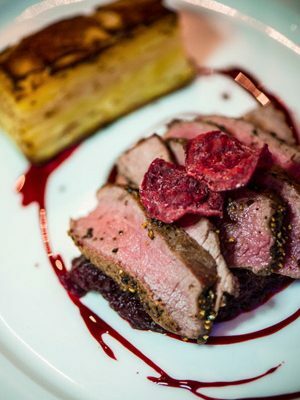 He then enjoyed peppered venison sat on beetroot puree with potato gratin. 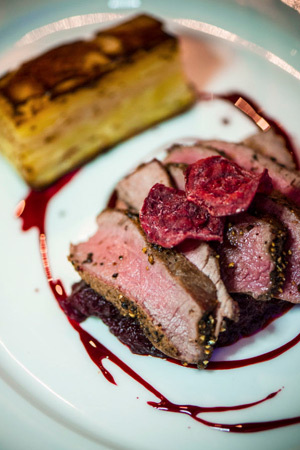 The Passori Rosso, a Merlot from Corvina in Italy complemented the red meat quite perfectly and should be preferred. We rounded off the meal by sharing a passion fruit cheesecake and a chocolate pot. 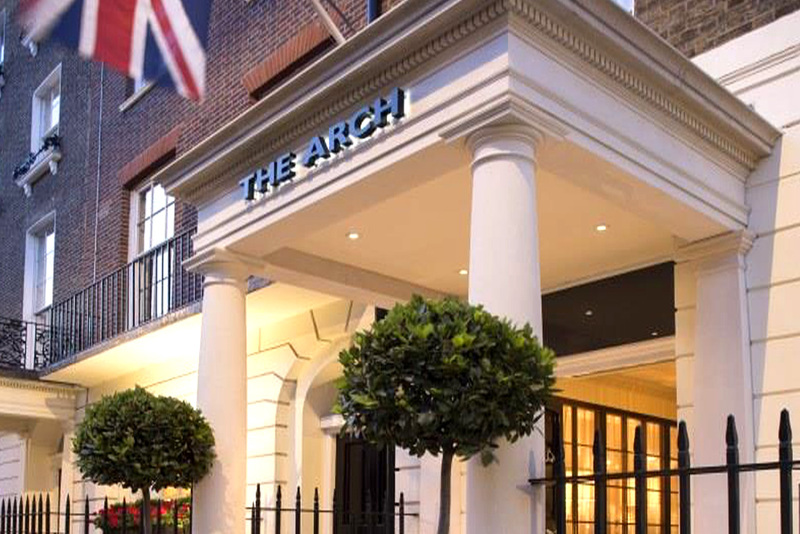 A member of Small Luxury Hotels of the World™, The Arch hotel has 82 bedrooms including four sumptuous suites spread over six floors, although the Asian influence is evident in the omission of the unlucky number four in the lift. The hotel is proactively dog friendly, offering chef-cooked canine cuisine and walking services in Hyde Park. There is also a very well-equipped gym, with excellent facilities including a PowerPlate machine and multi-functional Kinesis station. After an exceptionally quiet and peaceful night’s sleep on the blissful bed, it was a pleasure once more to luxuriate in the magnificent shower before heading to Hunter 486 for a slap-up breakfast. I eagerly tucked into a full English, featuring particularly impressive scrambled egg. 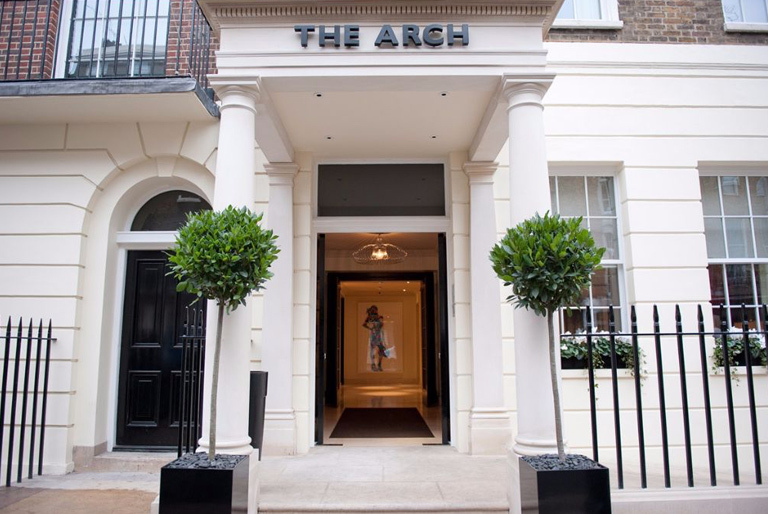 With excellent service, a superb location and exquisite décor and furnishings; The Arch is to be most heartily recommended.